I'm really sorry I've been away for a while. Hmmm!!!! This line is now becoming very popular in my post. Oh My!! I'm really sorry. Anyways, I bought this make up set a couple of days ago called Active Cosmetics. I was a bit skeptical because you know, its not a big brand like Mac, Bobbi Brown, Smash box, Estee Lauder or even L'Oreal. You know what I mean. But the truth is, it was actually really good. I was very impressed. So I decided to give out a few. So you guys remember the last time I gave something away it was a Cadence colour block mini hold all bag. (Check our Instagram page to see the winner - Deinma Kalio). Well this month, I'm giving away not 1 but 2 sets of Active Cosmetics Glamour Beauty Booster. 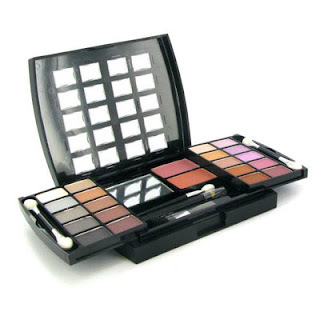 The set contains 20 Eyeshadows, 2 Blushers, Eye Liner Pencil & Brush Set. So those of you who are familiar with the process, you know the drill. Please send pictures of your beautifully made up faces to vernalmagazine@yahoo.com or add us on one of your pictures on Instagram vernalmag_uk or twitter with the hash tag #VMGiveAway, if you've got me on your BBM Contact, feel free to send it to me via BBM. For those of you who are not comfortable with the idea of sending your pictures, (FYI, I completely understand your worries) you can enter the competition by simply leaving your Your FIRST NAME and Your EMAIL ADDRESS as a comment on this post. Yes, it's as simple as that. If you'll be sending me your picture, please remember to use your name + VM Give Away as the subject when sending your picture for those sending via email. Also, please note that the concentration will be more on your face and not your body, so make sure you look as good as think is necessary. The names of winners will be posted right here on this blog, Facebook and on Twitter after which they'll be contacted ted email and will also have their pictures posted on the blog if they desire. So once again, Thank you for visiting my blog. I love you guys. God bless you.